We are breaking, flagrantly flouting our International Energy Agreement (IEA) that stipulates we should have ninety days supply. According to the latest Department of Energy figures, Australia sits well below this figure, with just 22 days’ worth of petrol, 17 days of diesel and 27 days of total petroleum products in Australia at any one time. China colonises South China Sea. $5.3 trillion worth of goods transits through the South China Sea annually. Over 64 percent of China’s maritime trade transited the waterway in 2016, while nearly 42 percent of Japan’s maritime trade passed through the South China Sea in the same year. The United States is less reliant on South China Sea, with just over 14 percent of its maritime trade passing through the region. Reliably calculating the value of trade that passes through the South China Sea is essential for assessing its geopolitical significance. A reasonable estimate can be calculated by considering bilateral trading partners with trade that is likely to transit the South China Sea. For instance, much of Europe’s trade with China rounds the Cape of Good Hope before crossing the Indian Ocean and entering the South China Sea via the Strait of Malacca. 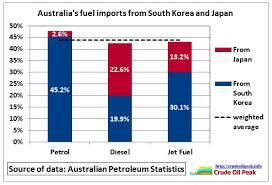 Japan and South Korea are Australia’s vital fuel oil lifeline. Where our fuels come from. Graph 1. Singapore supplies about 25% and the balance, ~30%, is refined here in Australia, of which 80% of that 30% is refined from imported crude oil. This means that Australia is almost totally (90%) dependent on imported fuel oil, both refined and crude. If oil imports stop, the country stops within thirty days or less. But, and it’s a big but, 45% of our total consumption of fuel oils, petrol, diesel, AV gas and so on, is refined in Korea and Japan (Graph 1). Over 40% of our diesel, 45% of our jet fuel, think ADF, and 47% of our petrol is refined by those two countries. We also have a small amount refined in China, would you believe? The crude that goes to Japan and Korea has to travel through the South China Sea to get there and the refined products have to make the same journey, but this time on it’s way to Australia (Map 1). It has been reported recently that China has put anti shipping Cruise missiles on the some of the South China Sea Islands. If this is true then one has to ask, why? Why have they seen a need to occupy and militarise the South China Sea? In case you have forgotten your geography. Map 1. Tensions in the South China Sea are rising. On March 31 2019 there was a story in the Sydney Morning Herald reporting that in the South China Sea tension is again mounting between China and the US. The rhetoric is building, the American fleet is on the move, this is from 6th April 2019. The sheer size of it all is daunting. Philippine President Rodrigo Duterte told China on Thursday to “lay off” an island occupied by Manila in the disputed South China Sea and said he would deploy his soldiers there if Beijing touches it. Bismark – The pride of the German fleet. The last battle of the German battleship Bismarck took place in the Atlantic Ocean approximately 300 nmi (350 mi; 560 km) west of Brest, France, on 26–27 May 1941. Britain like Australia, is an island nation.The first move against Britain by the Germans in 1939 was to blockade the shipping routes in the Atlantic Ocean in an attempt to starve the British into surrendering, and so began the Battle of the Atlantic, the longest battle of World War II. Britain had little oil of its own at the time, so all of Britain’s oil before and for the duration of the Second World War was sourced from America on the other side of the Atlantic Ocean. There is a chilling similarity to the position that the British got themselves into between the Industrial Revolution and the late 1930’s, and the position Australia finds itself in right now. We have allowed our politicians and powerful multi-national oil companies to ignore our national security and, unlike Britain in the 1930s, we don’t have a Winston Churchill to warn us of the dangers of being self-absorbed, complacent and inward looking. It took the invasion of Poland by the Germans in 1939 for Britain and much of Europe to realise that what Churchill had been telling them for years, was the truth. In the 1930s the leaders of Europe, including Britain, ignored, all the evidence of a resurgent industrial Germany led by Adolf Hitler. They failed to enforce the Treaty of Versailles (1919), which banned Germany from building tanks, warships, submarines and airplanes and limited it to an armed force of no more than 100,000. Hitler showed the world that to an ambitious leader a Treaty is not worth the paper it is written on. What will it take for our leaders to wake up to what could be our looming crisis in the South China Sea caused by the Republic of China annexing the Spratley Islands and dredging and building new islands, building runways to take their biggest bombers and equipping the islands with troops and missiles ? The military are certainly not there for a holiday, so what are they there for? If our shipping lanes through the South China Sea were disrupted if only for a few weeks or months, who would come to our aid? Try and imagine what resources, like diesel, petrol and AV gas we would need to keep vital supplies like pharmaceuticals and food, moving around this vast island? On present stocks the nation would stop in 4 weeks. The Battle of the Atlantic – One million tons a week in imports to fight for survival. Britain needed a million tonnes of imported material a week to survive and fight, including an enormous quantity of food. That is a staggering amount even today. The population of the country was about 50 million, all crammed into a small island about the size of Victoria (Aust), with few trucks and fuel rationing, Britain had to rely on an extensive rail and canal network to keep those supplies moving, it was a miracle that they and I, as it happens, survived. Defeat would have been inevitable if it hadn’t been for food, arms, munitions and personal sacrifice that Britain received from America and Canada and later from the rest of what was still the British Empire. Once the Germans got into France and they could be seen from Dover on a clear day, Britain’s southern ports, London, Portsmouth and Southampton were vulnerable to the German bombers, so the majority of that million tons a week in imports arrived through Liverpool, Clydebank in Scotland and other western ports like Cardiff and Bristol. Liverpool became the headquarters for the Atlantic Command and the busiest cargo port in the world. The cost of ‘The Battle of the Atlantic’ was devastating. Later in the War a Liberator bomber from Canada escorting a convoy for as far as it could into the Atlantic. When they turned for home it was days before planes from Scotland and Ireland could help. Over 70,000 sailors (about equal numbers from both sides) were lost in what became the longest battle of the second world war. In addition the Allies lost 3,500 merchant ships and 175 warships. The German losses were an amazing, 783 U boats (submarines) and 47 war ships among them the famous battleships, Scharnhorst, Bismark, Gniesenau and Tirpitz. Australia in 2018, has forty nine commissioned warships. How would we cope if diesel, petrol and AV gas were rationed? 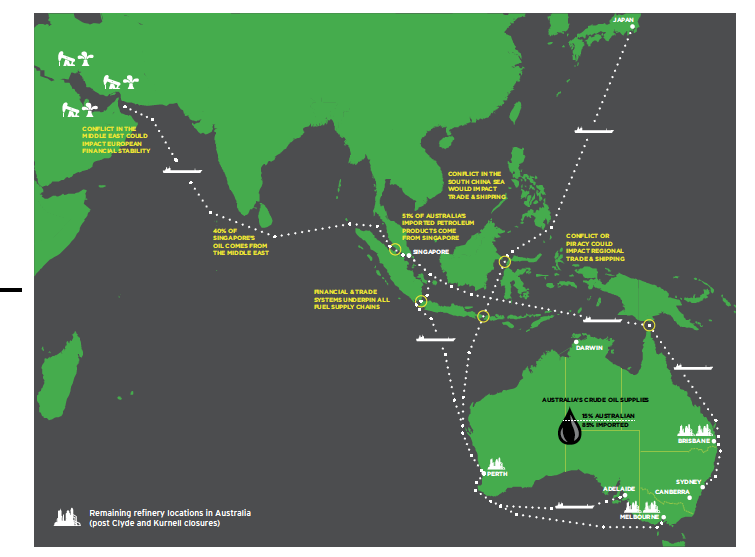 How long would it take to set up a shipping route to transport oil from the United States to Australia? It may all seem a bit far fetched, but I remember the shock waves that went through this country when Iran invaded Kuwait in 1990. The company I worked for at the time, ICI Australia, immediately imposed a four cylinder car policy. There was real concern that we would have fuel rationing. I was in the British army during the Suez crisis (war) in 1956 and the UK imposed petrol rationing for five months, my father, a business man, went from driving an Austin A40 to riding a Vespa Scooter. So these emergencies can happen when they are least expected. We have seen that we are vulnerable if the South China Sea shipping lanes are disrupted by China on its own or having a spat with another country. There is now another worry for Australia over which, again, we have no control. President Trump has torn up the agreement negotiated with Iran regarding nuclear proliferation and has warned that America will again impose what are aimed at being crippling trade sanctions against that country. This move could/will drive Iran out of the international oil trade and oil is Iran’s biggest and maybe only export of any consequence. America has sided with the Gulf States and Israel. OPEC have indicated they may well increase their oil production to fill the gap left by Iran, but Iran could still be mischievous and harass or threaten shipping in the Gulf with her well-developed missile capability. If she does delay ships moving through the Gulf, again we will be in strife. The United States has become a net exporter of oil. The United States of America has just become a net exporter of oil, for the first time in 74 years. Listen to the story of how they have done it. It hasn’t happened by accident. President Trump reversed decisions made by Barack Obama, developed closer ties with Canada contrary to what the ‘gossip’ press would have us believe, opened up the use of the latest technology in the fracking industry and made the United States the biggest crude oil producer in the world, bigger than the Gulf States and Russia. In this geo-political world this is probably the most important strategic development in the United States since the end of the Second World War. Even though they will continue to import and they will export some oil, this development means that the biggest military force in the world does not have to rely on another country for its fuel oils, it is independent. It will have sufficient to export some oil and more importantly, with the shale oil comes gas, billions of cubic meters, more than it needs for its own use, so they will export. While that is going on in America, Australia has found itself in the ludicrous position whereby consumers of Australian gas in Japan pay less for that gas than consumers in Australia. How can this be? Who runs the country? How can Australian industry compete with the rest of the world when the global oil companies who control the gas fields are working against the best interests of Australian industry? Europe relies on Russia for 35% of its gas – 195 billion cubic meters of it. The North Atlantic Treat Organisation (NATO) is a formal alliance between the territories of North American and Europe. From its inception, its main purpose was to defend each other from the possibility of communist Soviet Union taking control of their nation. President Trump recently reminded the Germans, the Italians and many more in Europe that the new pipeline, Nord 2, from the Russian gas fields into Europe would make them ‘captive’ to Russia and enable it to nearly double its current supply of 195 billion cubic meters of gas a year into Europe. This made Angela Merkle, ‘The Climate Chancellor‘, nervous, but the Europeans went ahead anyway because they need the Russian gas to keep people warm in winter and the Germans need it to keep wheels of their world beating and protected car industries, turning. But Germany is also a hypocrite because it is one of the biggest emitters of CO2 in Europe generating 906 million tonnes in 2016. Germany generates over 40% of its power from coal and 24.8% of that is generated from lignite or brown coal, the dirtiest coal in the world. Germany’s power stations account for an amazing 30% of the country’s total CO2 emissions, These ‘dirty’ power stations run 24/7 and excess power is exported to Europe. All this makes me wonder why Germany is often quoted as the doyen of climate change and an example Australia should follow. In the recent federal election in Germany only the Greens mentioned coal powered power stations – they wanted 20 of the dirtiest closed straight away. None of all the other parties, including those in government, had climate protection among their top ten priorities. CO2 emissions are increasing in Germany and they stand no-hope of achieving their 2020 or 2030 emissions reduction targets, in fact some politicians are calling for these targets to be abandoned to protect jobs. Germany’s target for 50% reduction for 2050 is now, surely, sheer fantasy? Remember how Merkle lectured Donald Trump when he pulled out of the Paris Agreement? “We have plenty of LNG that is my best offer, Angela, take it or leave it.” She took it. Twenty ships, right now, are laying over 1,200 km of steel and concrete pipeline from the Russian gas fields under the Baltic Sea and through the maritime territories of Sweden, Finland, Denmark and Germany. Denmark has still to give total approval for this politically sensitive project, but they will because they too need the gas. President Trump has offered American LNG to Europe in an effort to weaken Europe’s reliance on gas from Russia. President Trump also reminded all the NATO countries that they are bound by Treaty to spend 2% of their GDP on the defence of NATO, at present only the UK is meeting its obligations. The Germans and many others are quite happy to have the Americans propping up the defence of Europe, Trump has indicated that unless NATO countries start paying their way, he will take the American troops home. Love him or hate him, there is no arguing that President Trump has done whatever needed to be done to achieve an energy independence that many countries, including Australia, envy. No matter what happens to security, peace or war around the world, the United States will not have to rely on anyone to keep the country and its defences operating to capacity. Major economies like Japan, Korea and China will increasingly become reliant on imported oil and gas from Australia, OPEC and the Gulf States. This reliance could well moderate their foreign policy ambitions and strategic military influence. By the same token, it could make them more ambitious and difficult for Australia to contain if we remain weak and vulnerable. The Australian economy is heavily reliant on the People’s Republic of China and they know it. China takes some 30% by value of everything we export mainly coal and iron ore and 25% of everything we import is made in China. China has already shown us that it can and will disrupt trade between our countries, she has delayed coal and wine imports. Barley and beef have been subjected to all kinds of investigations, some say in retaliation of complaints in Australia of China ‘dumping’ in this market, interfering in our politics, think ex senator Sam Dastyari, or maybe it’s all about Huawei? Why does the quest for political power in Australia take precedence over national security? The question has to be asked, why have successive Australian federal governments placed this country into a position where we can no longer refine sufficient crude oil in Australia for our own use? Why have they allowed this country to have its strategic fuel oil policy determined by multi-national oil companies who have driven us to become almost totally reliant on other countries for our fuel supplies? Why are we totally reliant on the maintenance of world peace for our our oil supplies, when, as you will see, we have plenty of crude oil in this country, available right now, more than sufficient for our needs, and its just waiting to be extracted. We need a Donald Trump in Australian politics. To start with we do have, by world standards, very large reserves of oil. The Australian government reported in 2016 that we held 1.8 billion barrels of proven oil reserves. In addition we have proved and probable reserves of nearly 5.4 billion barrels (22% crude oil, 52% condensates*, and 26% petroleum gas (LPG). Most Australian crude oil is a light, sweet grade, low in sulphur and wax and so of higher value than the heavier crudes. Most of these reserves are located off the coasts of Western Australia, Victoria and the Northern Territory. We are not currently producing very much oil from shale because of technical and environmental challenges, especially in Queensland. That is in spite of there being 14 billion barrels of demonstrated or potential reserves, again, mostly in Queensland. According to the U.S. Energy Information Administration (EIA) Australia holds about 16 billion barrels of unproved but technically recoverable reserves in various parts of the country. Probably some of that is in the Northern Territory where the government has just lifted the bans on fracking. So we do have a lot of oil of our own, but we continue to import almost all of our needs. In 2005 we were refining 80% of our fuel oil needs in this country. By 2015 that was down to 50%. We use about a 1.1 million barrels a day (flat consumption since 2015) and we refine just over 400,000 barrels a day in refineries operated by BP, ExxonMobil, Shell, and Caltex Australia in Australia. Those same companies, after 2012, closed down what they claimed were outdated and small refineries which were producing in excess of 300,000 barrels a day at the time, and they shifted our requirements to refineries in Japan, Korea and Singapore, which of course they also own. So our current reliance on Korea, Japan and Singapore for refined product is another case of the Australian branches of international oil companies failing to reinvest in Australia as their older oil refineries became outdated. Whether they consulted with the governments of the day we do not know. Whether they consulted with those responsible for strategic defence planning we do not know. What we do know is that major international oil companies have been allowed to consider their bottom line before the fuel security of this nation. The other quite ludicrous practice that is taking place is that we are exporting the crude oil and condensates we produce on the Northwest coast to Asian refineries or to countries like Japan and China where they burn crude oil in electric power plants, the clever things! In 2016 Australian oil companies exported 192,000 b/d of crude oil and concentrates, most of which went to Singapore, China, Thailand, Malaysia and Indonesia. I’d like to see where all the oil we export finishes up. I wonder if any of it comes back in Australia as diesel or petrol from Singapore? The old trick of transfer pricing. Charge nothing for it as crude, put it through your refinery and send it back as value added product and sell it through your own filling stations at full retail odds. I’ll bet that the reason we rely on Japan and South Korea for our vital oil supplies is because to build a state-of-the-art oil refinery in Australia would not be a vote winner. Our so-called political elite, from both sides of politics, avoid talking about industry that could possibly be called ‘dirty’ because they are not prepared to confront and fight the activist groups who believe we should all wear hemp shirts, ride bicycles, get 100% of our electricity from wind and solar and if we need a car it must be electric and preferably shared with others and have three wheels, why three? They don’t wear out the road so quickly. The reality is that to be able to defend ourselves we need to be as oil independent from the rest of the world as possible and that will never happen with our kind of politicians. It is a strategically unacceptable position that allows multi national oil companies to determine how many days supply of petrol, AV gas and diesel we have in this country to keep it running and heaven help us, defend ourselves. Make no mistake, the ADF does not have stocks of its own, so when the country runs out of fuel oils, so too does our army, navy and air force.The ADF can’t fight and defend us or manage natural disasters in this country or anywhere with electric powered fighter aircraft, war ships or army vehicles because there aren’t any. They haven’t been invented yet! The other question that must be asked is why, like the United States, haven’t we been encouraging exploration companies to search for oil and prove up our known reserves? We have the money, but instead of spending it on a project to make more money to ensure that our future is secure, we are throwing $4 billion a year at renewable energy sources, like wind and solar, the subsidy scheme is due to run until 2030, so between 2018 and 2030 it will cost the Australian tax payer some $39 billion dollars. That expence could be justified if we were getting a decent return on our investment, but we’re not! An age of angry and unhappy people. Whether Australia will ever self-sufficient in oil remains to be seen. Progress and the development of our natural assets is not always determined by the people for the good of the people. We are too dumb to fight the minorities. Our asset development is often determined by a minority of activists who threaten the election or re-election of both state and federal governments if they don’t do as they say. Look at how the Labor Party kow-tow to the Greens for their preferences. Look at Adani. We live in an age of unhappy people who have been brain-washed by the post-modern (socialist/communist) deconstructionist propaganda that pervades our society. They have told lies to our children so that many of the little darlings believe that the world will end in twelve years due to global warming. So we have frightened children demanding change. Children who a few years ago believed in Father Christmas and fairies. They haven’t told those same children that China will increase its emissions next year by the same amount as Australia emits every year. This must be the third or fourth time in my lifetime I have been told the world will end within a decade. First it was the Cold War when I was in the army in Berlin in the fifties, that one was a close call, we did drills on what to do if there was a nuclear war. 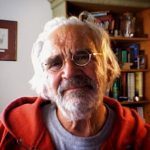 Then, in the sixties there was Paul Ehrlich and his book ‘The End of Affluence’ predicting that within a few years millions would die from starvation. Prof Norman Borlaug, the Green Revolution and the farmers of the world and their advisors ensured that didn’t happen. Then there was that home-grown Australian would be climatologist but actually a mammalogist, Dr Tim Flannery, Australian of the Year, Chairman of the Copenhagen Climate Council, who predicted that it was going to stop raining, and the dams would never fill again and there was going to be a massive rise in sea levels. He went on a lecture tour around the country and thousands paid to listen to him and be scared at the same time. He made films for the ABC, navigating the Darling and the Murray Rivers with John Doyle in a ‘tinnie’ and telling us all the river was going to dry up, and then, to prove his theory, he bought a house at the mouth of the Hawkesbury River on the proceeds. It is an offence under Australian Military Law to create a situation which creates alarm and despondency, it’s a pity it isn’t part of the Common Law, then Flannery could be called to account for his actions. Am I creating alarm and despondency? I have asked myself that question several times as I have been writing, consequently I have written and re-written this article many times. There are more references in this article than normal – I have checked and re-checked when I have quoted figures. I have tried not to be selective to make my point. Everyone agrees we have little fuel in the country, but not everyone agrees about China. Many people wanted to believe Neville Chamberlain in 1939, because it was easier. I hope I have accurately quoted dates and figures. Sure, there is no immediate threat of war in our region, but we have to recognise that China is, without doubt, beating the drum in the South China Sea. They have punished us a little already by delaying the importation of coal, iron ore, grain and wine into their country. They made us sweat a little. They reminded us of how much we rely on them for our standard of living. If you like, they showed us who is boss. All that China, Iran or even the ‘Little Rocket Man’ would need to do to create more than a little chaos in Australia would be to delay, not stop, delay, the oil tankers going to and from the Gulf States and using the South China Sea routes to get vital fuel supplies to Australia. In the next issue of The Global Farmer we ask the question ‘Is import substitution the answer?’ In Australia we have one of the biggest natural gas reserves in the world that is measured hundreds of billions of cubic meters. Every vehicle on the road and in the paddock, every internal combustion engine will run on LNG, but again, are we too complacent to make ourselves independent from the rest of the world? We are not infrastructure people are we? Albany has a gas grid from the old days of coal gas, but these days we truck Liquid Petroleum Gas (LPG) 500 km down from Perth in +100 tonne loads. We can’t get industry Albany because we don’t have gas (LNG) and we can’t have gas until we get industry. That about sums us up. We came down here in 1989 and a gas pipeline was being promised then. Our aspiring future Prime Minister, Bill (Robin Hood) Shorten and his Merry Men would have us believe that 50% of us will be driving electric cars by 2030. It’ll be you actually, I don’t think I will be around by then. They might be OK for people in the city, but when I have to do the 1000km round trip to Perth to see a specialist at present, and considering the queues at the watering holes on the way just to buy a coffee and a sandwich, I can imagine the chaos if everyone had to wait to charge their batteries. Or, if they had a bank of charging stations, what sort of power load would they draw on the country grid? Electric thee wheels! I told you. Extracts of the story can be found in the book section. ‘Bangalore’ can be bought on-line or ordered from any good bookshop anywhere in the world — it should then be delivered within ten days or so, maybe sooner. Modern technology is wonderful, ‘they’, I don’t know who ‘they’ are, print a copy just for you. Saves trees, saves booksellers keeping stock, great system. Previous PostAustralia – An Astounding Place.